I made this jungle animal themed cake for a little girl named Keila's 1st birthday. The funny thing is that this cake was for a family my mom went to church with whose baby shower cake I helped my mom out with a little over a year before (see the post Humpty Dumpty Sat on a Cake). So, it was cool to now be making her 1st birthday cake. 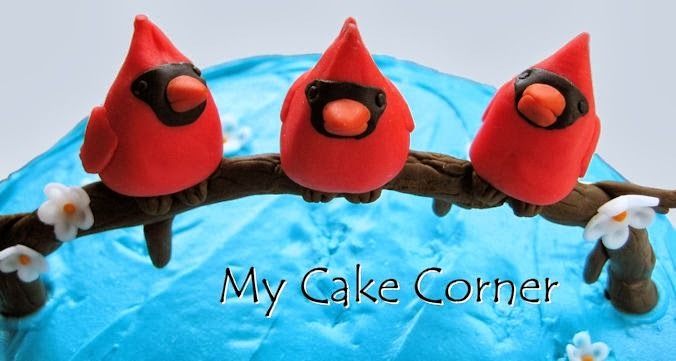 I also made the little smash cake below for the birthday girl to enjoy! 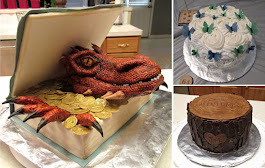 One party... Three Cakes - I made the cake of the dragon Smaug coming out of the book The Hobbit for my dad's 65th birthday. I made the cake with the roses and butterflies for my mom for her 64th birthday. The tree stump cake I made for my Uncle's birthday.